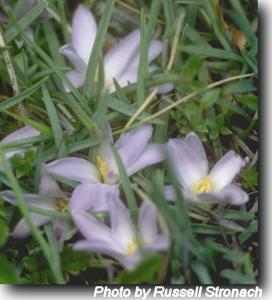 Attractive lily flowers, about 2 cm across, white to lilac or blue, always at ground level. Rhizomatous creeping herb , forming spreading clumps. Alpine and sub-alpine areas in moist to wet grass and heath. Winter chilling apparently is necessary for successful flowering. Best success in cultivation is with container-grown plants in cooler temperatures, with the base of the container submerged in water. Suitable below powerlines. Sow seed on moist to wet peat.